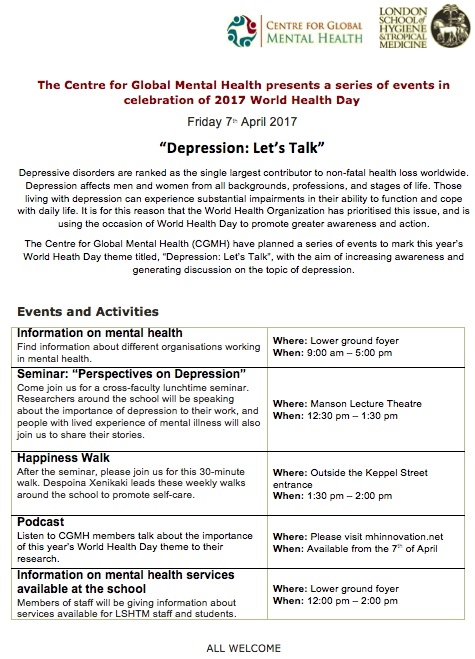 In this special-edition MHIN podcast celebrating World Health Day 2017, mental health nurse and MHIN communications assistant Emma Gilbert interviews members of the Centre for Global Mental Health to hear about their work and how it addresses this year's theme of depression. This podcast is part of the Centre's series of events to celebrate World Health Day 2017 on 7th April. See below for a full list of activities- all are welcome to attend!